Guided or independent. Pack-free or carry your rucksack. These are some of the things you’ll think about when considering taking on Tassie’s Three Capes Track. So we thought we’d show you what you get on a Life’s An Adventure Three Capes walk compared to walking the Three Capes Track. The official Three Capes Track is a 48km walk done by independent hikers over four days where you stay in three well made public huts, bunking down with other fellow hikers. You carry all your gear, cook for yourselves and using the map provided, follow the beautifully made path between capes Pillar and Huay. (You get glimpses of the third cape, Cape Raoul). This is a very popular walk and you need to book six to 12 months in advance to do it. The Tasman Peninsula offers amazing views. Life’s An Adventure’s Three Capes walk is a different beast. 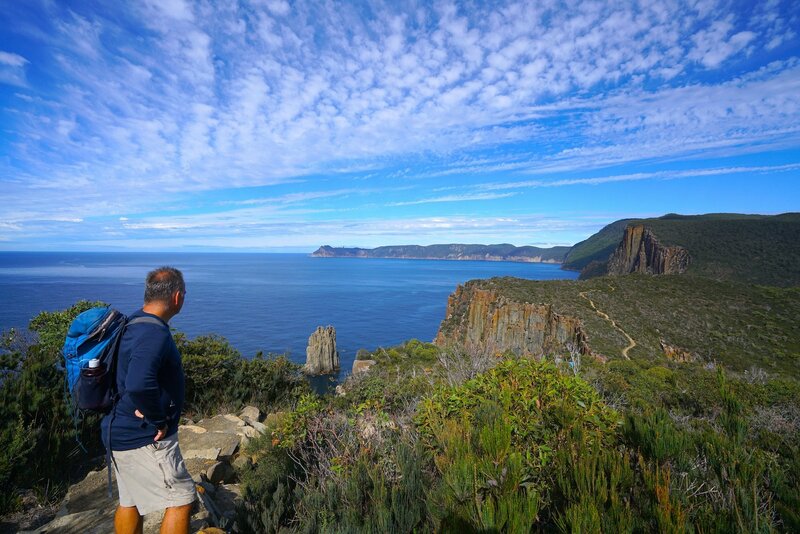 This is a three-day pack-free walk where a professional guides leads you to the many highlights of the Tasman Peninsula. The first day’s walk is to the magnificent Cape Raoul, that you only get glimpses of on the Three Capes Track. Everyday you’re transported to and from the walk in a minibus and before you start walking you get to fill you snack bag with whatever sugary and/or salty treats that take your fancy. These are provided by your always-helpful guides – and no doubt they’ll thrown as few ripping yarns on the way. Like the one about Martin Cash – one of the only bushrangers to die of old age! The huts on the Three Capes Track are beautifully made and feature shared kitchen/dining areas equipped with heating, basic cooking facilities, solar-powered lighting and running water. Sleeping quarters feature individual bunk platforms with mattresses, and toilets are a short walk away. Accommodation with Life’s An Adventure is quite a step up. 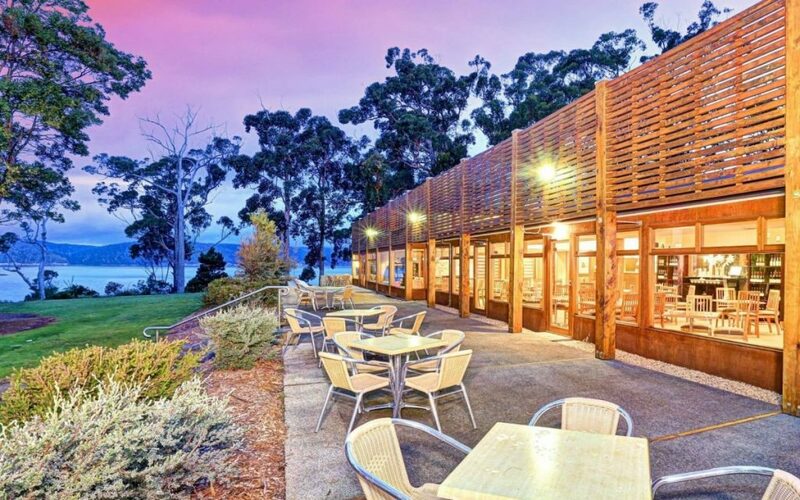 Your two nights are spent in the deluxe spa chalets at Stewarts Bay Lodge, just down the road from historical Port Arthur. Each chalet has two bedrooms and two bathrooms plus loungeroom. It’s one of those places you look forward to heading to after a long day on the trail. Food on the Three Capes Track, well that’s up to you. The Port Arthur gift shop has a range of dehydrated meals, snacks and beverages and Three Capes Gear and Gourmet sells a selection of premium DIY meals including reasonably tasty wine in a bladder. Now one thing Life’s An Adventure prides itself on is sourcing quality local food and wines and the meals at Stewarts Bay Lodge’s restaurant Gabriel’s exemplify this. How’s native pepper berry cured ocean trout sound? Or Tasmanian grass fed eye fillet? Yep, you get the picture. And wine, well you won’t find better pinots than the ones at Gabriel’s. You have to walk the Three Capes Track in one direction but you have all day to get to each hut so there’s no need to rush. With Life’s An Adventure you have two choices of walk depending on your fitness – one is a moderate graded, longer walk, the other option is a series of shorter walks with a bit of sightseeing thrown in. Whichever one you choose you’ll have a satisfying and inspiring day. 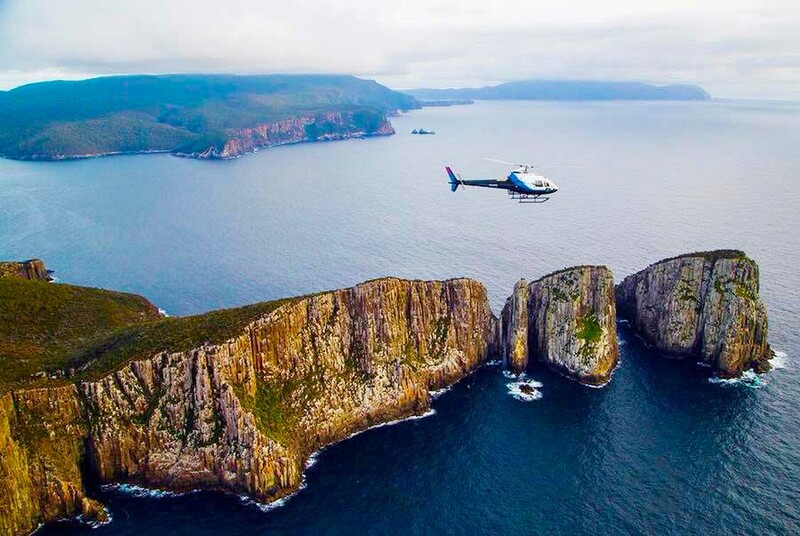 A scenic heli flight over the Tasman Peninsula. And one last thing, the final ‘WOW’ factor – it’s that one thing that every Life’s An adventure walk has; the icing on the cake. In the case of the Three Capes walk it’s either a scenic helicopter ride over the Tasman Peninsula or a wilderness cruise around Cape Pillar, jutting impressively out to sea. “Ah, but what about the costs,” I hear you say?! Walking the Three Capes Track will cost around $500 per person, the Life’s An Adventure walk will cost you *$1499, offering excellent value (if I do say so myself!). Now the rest is up to you!